The AR15 rifle/M4carbine is also known as a sport utility rifle due to the fact that it is widely accepted and available around the world. It is a light weight, easy to use defensive system that has proven itself while in service while in all climates and locales over the last 40+ years. 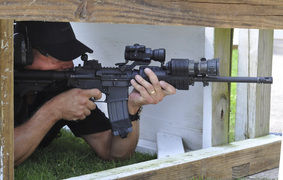 This 1 day course will cover the proper setup of your rifle as well as the accessories for urban settings such as home defense and in rural environments as well. We will explore the proper use of cover, movement to and from cover, natural and improvised shooting positions, zeroing, sling configurations, medium and close snap shooting, multiple targets, malfunction clearing drills and firearm transitions. We will cover transitions from rifle to pistol as well. All semi-automatic rifles such as the AR15, M4, AK47, SKS, M1A, etc are acceptable. REGISTRATION CLOSED FOR THIS COURSE! When signing up for a class be sure to fill out an online Personal Defense Systems Registration Form for each person attending. We need your payment and your registration form in order to process your request. Your PayPal receipt will be from "Ohio Shooting Sports"